Baldwin Beach Park is a beautiful, long white-sand beach on Maui's North Shore. A favorite with local families. In a nutshell: Baldwin Beach Park is a beautiful, long white-sand beach on Maui’s North Shore. A favorite with local families. Minuses: Surf in the middle area can be rough. 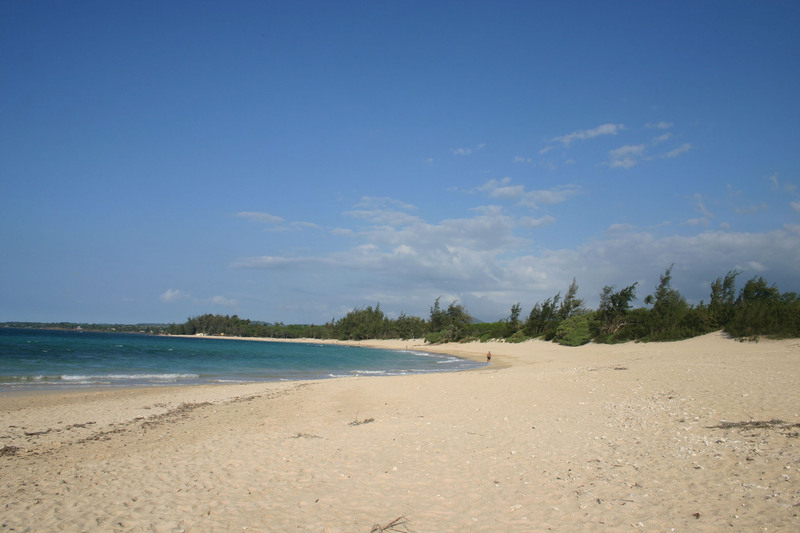 Baldwin Beach is a wonderful, long, wide, sandy beach park just outside of Paia. Fully equipped with lifeguards, bathrooms, showers, barbecues, picnic tables and a covered pavilion. There are also protected swimming areas on both the east and west ends that offer calm pools for even the littlest ones. (The west end is know as Baby Beach and the east as Baldwin Cove). With all this going for it, Baldwin Beach Park is the most popular beach destination for North Shore families. On weekends and holidays the large parking area can become packed, but have no fear if you like privacy – there are always large empty stretches of beach, and even on the busiest days you can claim a nice secluded swath of sand all for yourself! If your travels bring you by the North Shore early in the morning, definitely pit-stop here and take a long beach stroll – Baldwin Beach typically has a mystical feel in the early morning that is quite different from the vibe late in the day. This beach also features spectacular sunsets. Facilities: Lifeguards, Showers, Bathrooms, BBQs, Picnic Tables, Covered Pavilion, Electricity. I am a Maui resident, how do I reserve the covered pavilion for a family party? Can you safely park at Baldwin Park? Planning on starting there on my climb up Haleakala. Thanks. Not for a family party. things like the Earth Day celebration or commercial require permits. Do you need a permit to reserve the tables for a larger party? Is it possible to camp here? any permit is required? You can not legally camp on Baldwin Beach Park. The closest legal campground to there would be Kanaha Beach Park, though I’m not a big fan of that campground as it tends to attract a rougher crowd. My favorite campsite is in Kipahulu at the National Park – and that campground is also free and requires no permit.